I published my Banana, Nut, Chocolate-Chip Bread recipe in the past. It was, and still is, unbelievable. Now, my pumpkin edition is here. This also is moist and perfect for my taste just like its banana cousin. See what you think. Remember, this is a treat. You can’t eat the whole loaf and still call your diet “healthy”. 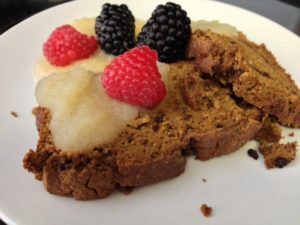 There are approximately 2,650 calories in the entire loaf with 136 grams of net carbs (grams of carbs minus grams of fiber) and 60 grams of fiber. I get about 18 thin slices from the loaf, and freeze them for later. In the photo, I topped the slices with organic applesauce, fresh raspberries and fresh blackberries.